While walking this trail, keep this in mind: Knowing the answer is key, but make sure you discuss how your answer came to be. You might be surprised at just how many different ways you can find. Which side of the street has odd street numbers? Each crosswalk has a red rectangle with bumps on either end. How many bumps are in each one? Do you have a fast way of counting these? If so, what is it? How many crosswalks in total did you use on this trail? How many of the red rectangles did you cross over? Find all of the street numbers on this trail that are divisible by 3. Find as many different 2D shapes as you can (e.g. square, hexagon, parallelogram). Find as many different 3D shapes as you can (e.g. cylinder, prism, hemisphere). Write and answer your own math trail questions. There is a phone number on the window of the Dhanwantari Center for Yoga, but 4 numbers have been replaced with letters. What numbers would you have to dial? Make up your own alpha-numeric code and write "Bombay International" in that code. "Peep" in the name of the Le Peep restaurant is a palindrome, meaning it is spelled the same forward and backward. We say a number is a palindrome if it is the same number when we write its digits backward. Are there any street numbers on Michigan Street that are palindromes? What is your favorite palindrome number? The Quizno's Subs restaurant has both rectangular and circular tables. The manager wants to have 3 stools at each circular table and 4 chairs at each rectangular table. How many of each does she need? Write a number sentence that leads to the total number of seats. 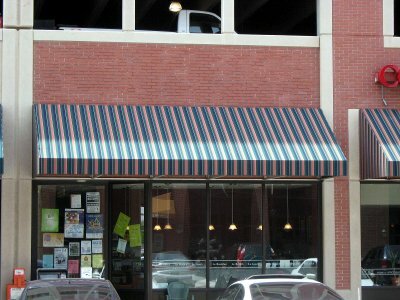 Challenge: What is the surface area of one of the striped awnings on this block? Be sure you can explain how you got your result. How many different items are advertised (in script words) on the window panes of the Chicory Café? What is the ratio of beverages to food items? How many hours per week is the Chicory Café open? Jimmy John's prides themselves on having your sandwich ready within 30 seconds of the start of your order. If there is a steady stream of customers how many orders could they fill in 10 minutes? Jimmy John's has 2 bread choices, 5 meats, 1 cheese, 7 vegetables, and 3 condiments. If a sandwich has 1 type of bread, 1 meat, 2 vegetables and one condiment, how many different sandwiches can be made? How many different sandwiches can be made if the only requirements are that it has one type of bread and at least one non-condiment filling? There are three newspaper boxes outside of Jimmy John's. How many quarters would it take to buy the weekday South Bend Tribune? How much would it cost to buy one of each of the three daily papers? Which Sunday paper costs the most? How much more is it than the cheapest? 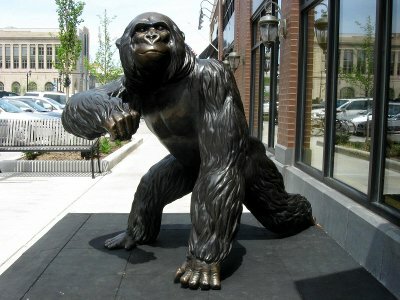 Take a look at the statue of the gorilla outside the Chocolate Café. Who is taller, you or the gorilla? By how much? The gorilla is crouched over. How tall would he be if he stood to his full height? What is the ratio of the gorilla's arm length to his leg length? How does this compare to your body? 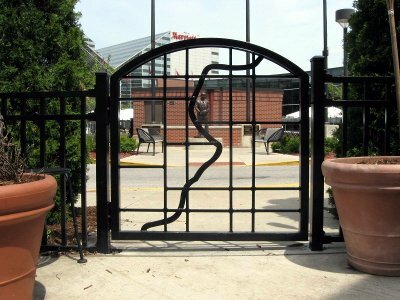 Looking at the gate leading to the outside seating area of the Chocolate Café, you see a representation of the St. Joseph river passing through several "windows" of metal. How many of these windows are rectangles? How many are not rectangles? Is a square a rectangle? The Chocolate Café sells regular hot chocolate for $1.99 and specialty hot chocolates for $2.49. How much more is a specialty hot chocolate? How many regular hot chocolates could you buy with $10.00? Would you have any money left over? If so, how much? Looking East between the Chocolate Café and the College Football Hall of Fame, you can see a portion of the Century Center. What angle is the peak of the roof above the entrance you can see? Stand on the 14 yard line of the field in front of the College Football Hall of Fame. Be sure you are facing away from the goal. Walk forward 7 yards; back up 3 yards; lose another yard; then advance 6 yards. What yard line are you now standing on? If these were your four down attempts, did you make your first down? Measure the width of the goal post with your height as one unit of measurement. What fraction of a full football field is this field? What portion of the background of the Wells Fargo sign is red? What is the radius and circumference of the stone planter on the corner of Jefferson and Michigan? How many years has the Dainty Maid Bake Shop been in business? The Downtown South Bend logo has two different colors of squares. How many different ways can you arrange these four squares so that they stay in a 2×2 grid? How many different ways can you arrange them if they stay touching each other but not necessarily in a 2×2 grid? Popstyle Gourmet Popcorn Shoppe claims to have over 60 flavors. We went inside and asked about this. They have 14 candy flavors, 13 savory flavors, 5 classics and 2 sugar free flavors. How many total is this? Why do you think they say they have over 60 flavors? The Backstage Grill has a 3×5 rectangular grid of windows. How many total rectangles can you find in this array? Look at the name of the floral shop. What is the ratio of consonants to vowels in the name of the florist? What fraction of letters in the name are consonants? What percent is this? Approximately what percent of the flowers in the florist's windows are yellow? What is the street number of the old State Theater? How do you think this came to be? How many hours during the week is the Idle Hours Bookshop open? What shapes do you see in the Notre Dame Federal Credit Union logo? Can you draw it? Can you draw the mirror image of the logo? Look at the set of benches in the Key Bank Plaza. Write a few number sentences that lead to the number of benches in the plaza. What does each number in your sentence represent? How many slats are on one bench? How many slats in total are on all of the benches in the plaza? 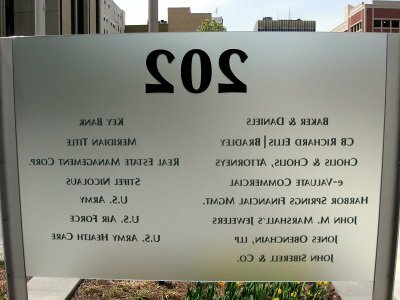 The directory for building 202 is visible from both the front and back of the sign. Which numbers and letters look the same from both sides? These numbers and letters are said to have a vertical line of symmetry.